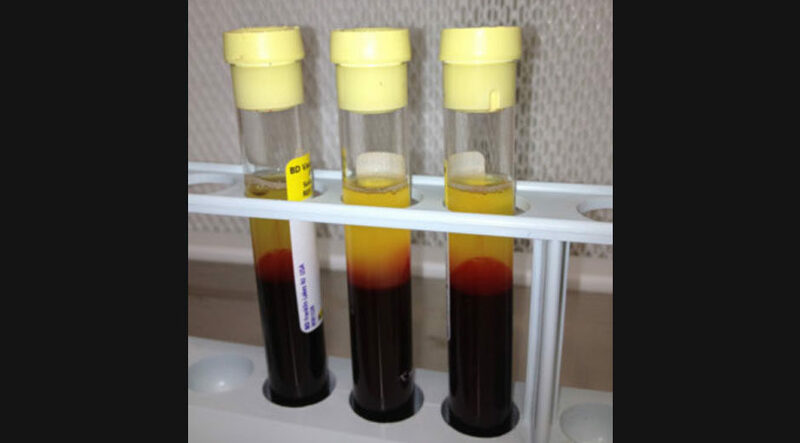 PRP can be made in many different ways, from expensive commercial systems, to simple manual methods that can be performed by a doctor in their rooms. To date, there has been no “optimal” way to produce PRP, and depending on the injury being treated, different ways are likely to have different effect. Blood is taken from your arm just like when you have a blood test. The amount taken depends on the area being injected and varies from 12-24 mls. It is then spun in a machine to separate the blood into 3 layers. 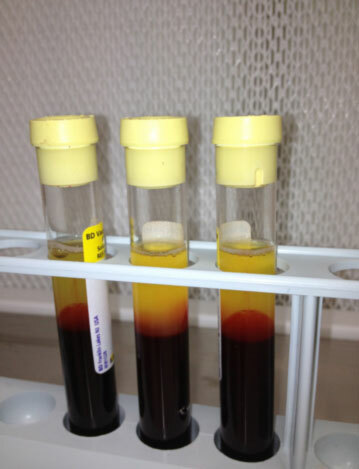 The bottom layer is red blood cells, the top layer, platelet poor plasma and the middle layer, platelet rich plasma. This middle layer is where the liquid for injection is then removed. Injections in certain tissues will be performed under ultrasound guidance to improve their effectiveness. WHERE DOES IT FIT INTO MY TREATMENT? It is important that PRP injections are only a part of managing your injury. They need to be combined with the other important treatments your doctor will discuss with you as a part of your rehabilitation program. Patients are required to stop taking anti-inflammatory tablets one week prior to the PRP procedure. If you are unable to do this then explain this to the doctor. Patients should not stop taking their regular aspirin or blood thinning medication. Injections often take 30 minutes to be completed. If possible it is recommended that you have someone drive you home. The doctor will warn you if this is necessary. Ideally you should rest the area that has been injected from excessive use for at least 24-48 hours before returning to your rehabilitation program. As the procedure uses your own blood there is no risk of HIV, Hep B, Hep C or other blood borne infections. It has also been shown to have anti-bacterial activity against common skin bacteria, which are the major source of infection in joint injections (As with any injection there can be some pain/discomfort as well as bleeding and bruising associated with PRP. To reduce chance of infection all injections are done under sterile conditions. Injections can be uncomfortable. Where possible local anaesthetic is used to improve comfort. You may feel discomfort for 1-2 days. Some people may experience a vasovagal episode during or post injection where they feel lightheaded and sweaty. This is self-limiting. and passes after minutes. 2. Sánchez M, Anitua E, Azofra J, Aguirre JJ, Andia I. Intra-articular injection of an autologous preparation rich in growth factors for the treatment of knee OA: a retrospective cohort study. Clin Exp Rheumatol. 2008 Sep-Oct;26(5):910-3. 3. Baltzer AW, Moser C, Jansen SA, Krauspe R. Autologous conditioned serum (Orthokine) is an effective treatment for knee osteoarthritis. Osteoarthritis Cartilage. 2009 Feb;17(2):152-60. Epub 2008 Jul 31. 5. Filardo G, Kon E, Della Villa S, Vincentelli F, Fornasari PM, Marcacci M. Use of platelet-rich plasma for the treatment of refractory jumper’s knee. Int Orthop. 2009 Jul 31. 6. Mishra A, Pavelko T. Treatment of chronic elbow tendinosis with buffered platelet-rich plasma. Am J Sports Med. 2006 Nov;34(11):1774-8. Epub 2006 May 30. 7. Peerbooms JC, Sluimer J, Bruijn DJ, Gosens T. Positive effect of an autologous platelet concentrate in lateral epicondylitis in a double-blind randomized controlled trial: platelet-rich plasma versus corticosteroid injection with a 1-year follow-up. Am J Sports Med. 2010 Feb;38(2):255-62. 8. Kon E, Filardo G, Delcogliano M, Presti ML, Russo A, Bondi A, Di Martino A, Cenacchi A, Fornasari PM, Marcacci M. Platelet-rich plasma: new clinical application: a pilot study for treatment of jumper’s knee. Injury. 2009 Jun;40(6):598-603. Epub 2009 Apr 19. 10. Bielecki TM, Gazdzik TS, Arendt J, Szczepanski T, Król W, Wielkoszynski T. Antibacterial effect of autologous platelet gel enriched with growth factors and other active substances: an in vitro study. J Bone Joint Surg Br. 2007 Mar;89(3):417-20. 11. Barrett S, Erredge S. Growth factors for chronic plantar fascitis.Podiatry Today. 2004;17:37–42. 12. de Vos RJ, Weir A, van Schie HT, Bierma-Zeinstra SM, Verhaar JA, Weinans H, Tol JL. Platelet-rich plasma injection for chronic Achilles tendinopathy: a randomized controlled trial. JAMA. 2010 Jan 13;303(2):144-9.